There aren't many people who can claim to have gone from cutting their musical teeth while working on a fishing boat, to performing on national television as part of a taxi-driver's musical collective, to playing for one of the top Cuban bands of their era. Heriberto "Tito" Gonzales enjoyed just such a rapid ascendance from cabbie to celebrity and star of the Cuban music scene, playing son (a style of music popular in the 1920s and '30s that combines Spanish-influenced song and guitar with African rhythms and percussion instruments) with the famed group Conjunto Estrellas de Chocolate. Now residing in San Francisco, this consummate master of Cuban traditional music brings a fresh sound to a lifetime of experience, in live performance and on CDs like his new Al Doblar la Esquina. Tonight, Tito makes his Freight debut at the head of a band dedicated to playing rumba, guaracha, and son: traditional, high-energy Cuban dance music pioneered by greats like Arsenio Rodriguez and later revived by the film Buena Vista Social Club. 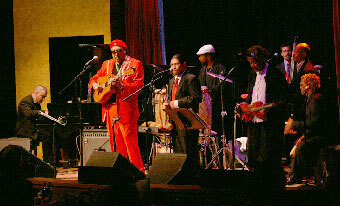 A flawless and engaging showman, Tito sings and plays the Cuban tres guitar that drives the music, leading a band that includes Miguel Martinez (flute and vocals), Bob Karty (piano), David Frazier (congas), Colin Douglas (drums), Sandy Poindexter (violin), and David Pinto (bass). Rather than a dance show, tonight's performance offers a chance to sit back and let your ears be seduced by an aural feast of authentic Cuban music.